It was the second day of our “juggernaut” master plan to control the vending area and to restrict vending at the market to only vendors with membership tags. We have printed out about 216 memberships so far, so there should be more than enough vendors to fill the market. The volunteers showed up at 8am today, and the washing crew showed up a little earlier at 7:30. We had three security guards on duty during the day, so this helped quite a bit. This was an amazing achievement for our volunteers. 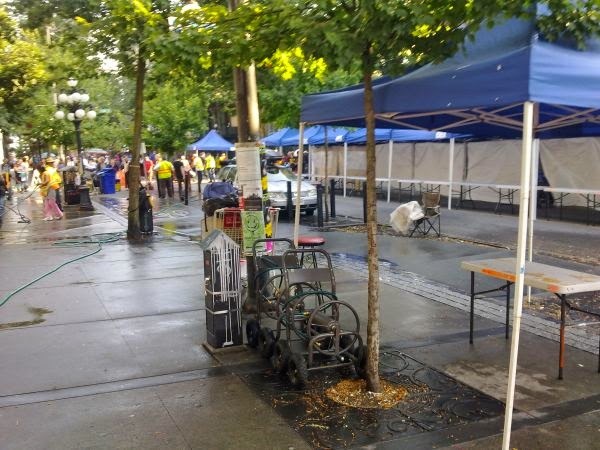 The only people that we let into the area before 10am were vendors with proper membership cards, or people that could prove that they lived in the DTES. The result was a much more orderly market, and a lot of vendors that realized that we are serious about the membership system. 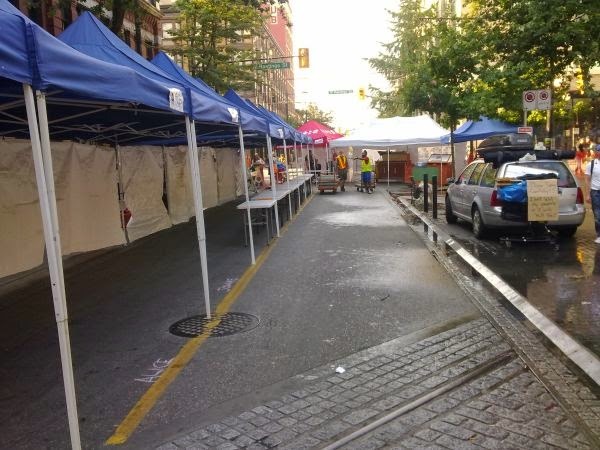 This will also make it a lot easier in our move to 58 West Hastings St.
Only properly registered vendors will be allowed to vend in this space, and only in areas designated with tents and tables. It shows that with the right funding we can run a controlled market… something that the whole of Vancouver can be proud of. This was also (hopefully) the last Sunday where the park will be cut off by fencing. We were assured that a scaffolding would be going up around the Merchant bank, and that the fence would be taken down, allowing us access again to the water tap in the grassy area. A final funny story that I have to share happened at the market this Sunday. So, during the day, there are probably at least half a dozen radio calls about “Cheese at the Market” or “another guy spotted with Cheese”. Sometime in the afternoon, a VPD officer walked up to our guard at the North End of Carrall St. He was quite friendly, and asked the guard “So… what does ‘Cheese’ mean?”. The guard didn’t know what to say, so he said “Cheese just means Cheese – you know…. people walking around with stolen cheese trying to sell it”. We had a good laugh about this after the guard told the story. I guess it makes sense that there was a suspicion from the VPD that “Cheese” was a code word for something else like “Bread” meaning money, or “Smack” or any other euphemism for drugs. Considering that a good portion of our radio broadcasts during the day are about the “Cheese at the Market”, it would stand to reason that they would be confused. So, after that story, just let me confirm the basic rule: “No selling cheese (and any dairy product) at the Market!”. The temperatures soared over 32 degrees. This time, we were fully prepared with lots of freezies, icecream, and cold pop in our freezer and cooler. It was a record day for selling… over $425 – which makes an all time Street Market record!!! This Sunday was our Pride Market. The pride parade was happening all over the West End, and some pride celebrations were visible at our market throughout the day. It was also the third day with our new security guards. The great beginnings progress is coming along amazingly. We now have 3 large murals being painted, and offer 45 distinct jobs during Sunday (our old figure was between 28 and 30). This week we added the positions of “Greeters”. The greeters will stand at the entrances of the market to maintain our perimeter. They will have the opportunity to stop someone that wants to vend and is not a member of the market, and will also be able to call for help if there is trouble. The greeter on the north end of the market was given a radio, since they will be quite separated from the main tent. Our hope is to pick up a few more, but with only one channel, we are limited to about 10 radios without having too much cross talk. Only a few incidents to mention – a couple was arguing and needed to be escorted out of the market, and our RPIC#2 became sick early in the day and needed to go home. For a total of 133 volunteer hours every Sunday. This does not include the 16 hours of time from the BST trained security guards. So, the grand total number of human-hours it takes to put on the market has jumped to 149! 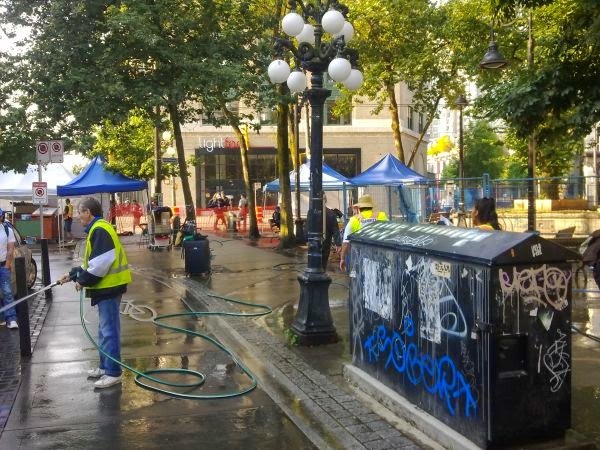 This is such an amazing example of achievement for the Downtown Eastside and we are so proud of the volunteers each and every week. We counted 188 Vendors at noon. This was a great number. Hardly any incidents and good mood at the market the whole day. 67 total tables deployed during our event.